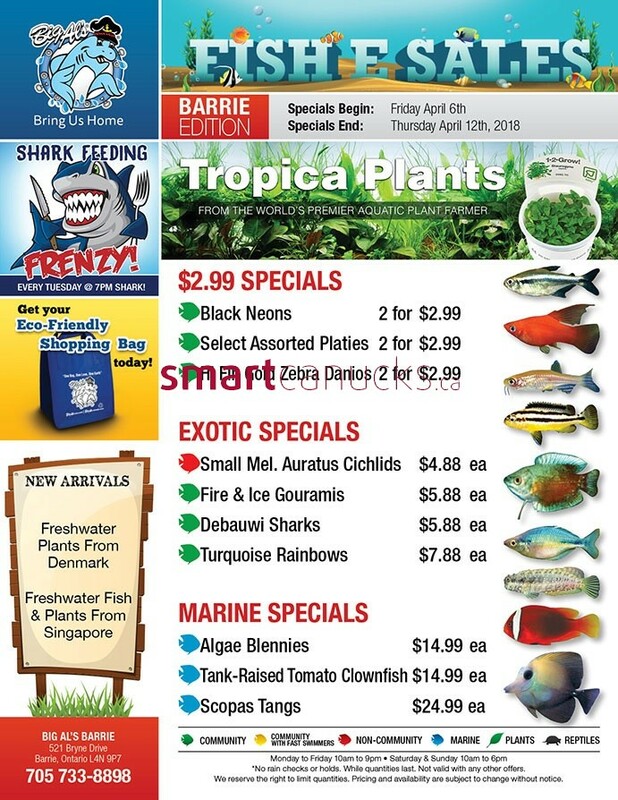 Big Al's Canada Flyer April 6 - 12, 2018 - Bring Us Home Shark FEEDING EVERY TUESDAY 7PM SHARK! Get your Eco-Friendly Shopping Bag today! 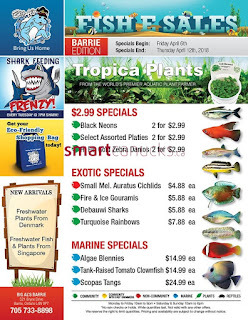 NEW ARRIVALS Freshwater Plants From Denmark Fresh Water Fish & Plants From Singapore. Black Neons 2 for $2.99. Select Assorted Platies 2 for $2.99. Zebra Danions 2 for $2.99. Big Al's Canada Flyer EXOTIC SPECIALS *Small Mel. Auratus Cichlids $4.88 ea. Fire & Ice Gouramis $5.88 ea. Debauwi Sharks $5.88 ea. Turquoise Rainbows $7.88 ea. MARINE SPECIALS *Algae Blennies $14.99 ea. Tank-Raised Tomato Clownfish $14.99 ea. Scopas Tangs $24.99 ea.